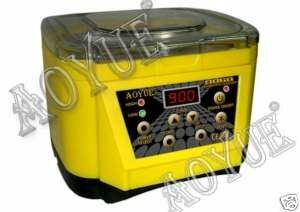 1.Aoyue 9060 Ultrasonic Cleaner is a microprocessor-controlled device that uses ultrasonic or high-frequency sound waves to clean tools and delicate items. 2.The ultrasonic cleaning works on the principle of cavitation.. 3.The vibrations generated by the transducer produce tiny, microscopic bubbles that expand and rapidly collapse, which create the effective cleaning action on the surface of any solid part.. 4.The device has a fully digital control panel for easy adjustment of operation parameters and a digital read-out of time for quick reference.. 5.It can hold up to 1000 mL of cleaning solution through the high-capacity stainless steel tank.. 6.This is effectively useful for cleaning and removing oil, sand, dirt, and unwanted residues that have stick to the surface and even penetrated the internal sections of most tools and instruments that we use on a daily basis... 7.Among these are jewellery and accessories, watches, coins, mechanical tools, dental and medical instruments, lens and optical components, as well as electronic equipments and parts.... Features: 10 to 900 seconds (15 minutes) cleaning time option.. One-touch quick cleaning using default system parameters... High-capacity stainless steel tank that can hold up to 1000 mL of cleaning solution... Innovative design with crystal clear cover for quick and vivid view of the cleaning process.. Excellent for cleaning electronic tools, circuit boards, jewellery and accessories, medical and dental instruments, lens and optical components, and other mechanical parts and precision tools... Power Input: Available in 110V / 220V. Cleaning Power Options:Dual Options (High or Low). Cleaning Duration:10 to 900 seconds (15 minutes). Tank Capacity:1000 mL. Tank Dims (Internal):	148 (w) x 64 (h) x 134 (d) mm. Exterior Dims (Main Unit):	202 (w) x 155 (h) x 210 (d) mm.